We at Pacific Dream Photography were blown away by this well planned proposal on the Island of Kauai. What began as a simple girls day out photo session ended as the sweetest surprise proposal. When Lindsey booked a girls photo session at the Grand Hyatt Kauai with Pacific Dream Photography, she had no idea what surprises were in store. Little did she know, her soon to be husband reached out to us in advance with his sneaky proposal plan. After a laugher filled girls beach photo session, we took Lindsey and her friends to the Mahalapu Heritage Trail. Jeremy anxiously awaited his bride to be, as he stood in a secret disguise. When Lindsey least expected it, we gave Jeremy the signal to surprise her. Finally Lindsey laid eyes on Jeremy, she couldn’t grasp that he was here in Hawaii. Not only did he fly all the way here to surprise her, he was down on one knee and popping the question. Of course Lindsey said yes! It was a truly magical moment. When Lindsey looked up, the soon to be married couple’s family appeared as well to celebrate the engagement. It seemed as if the surprises never ended! Jeremy pointed out everyone who had been a part of his secret master proposal plan. They shared many laughs, happy tears, and excitement. We could feel the love and joy between everyone. To commemorate the day, Jeremy brought along some fun props for the now, engagement session. Their enthusiasm and fun lightheartedness mirrored each other and highlighted exactly why they were simply meant to be. It’s such an privilege for us to document these special moments when two lives change forever. What better way to capture an engagement photography session, than overlooking the Hawaiian sunset? Lucky for this couple, they get to cherish the memories forever with gorgeous photos on one of Hawaii's most beautiful landscapes. After the surprise proposal, we headed down to Shipwrecks Beach for even more candid photography. The couple ended their photo shoot with a jump in the foaming Hawaiian waves, as they shared a true love’s kiss. If a standard proposal just won’t do for your sweat heart, contact us at Pacific Dream Photography. We will help you come up with something amazing and capture your dream proposal. We can help you come up with a plan to sweep your partner off of their feet. You can almost see it, the pristine beach, the warm sand between your toes, and the sunny blue skies as you hold your lover’s hand among the shoreline. Just the name Hawaii sounds romantic. For many, Hawaii is a dream destination and if you are lucky enough to pay Hawaii a visit, you are in for a real treat. We recently had the pleasure of photographing Daniel and Courtney at the Grand Hyatt Kauai Resort and Spa. If you want to see Hawaii on a grand scale, stay at the Grand Hyatt Kauai Resort and Spa. Nothing can top this place for a romantic getaway. The tropical grounds smell of sweet scented plumeria and you can’t forget the stunning ocean views. This very much in love couple opted for a sunset session to celebrate their seven-year anniversary. There is no doubt that Hawaii is for lovers. We have the joy of capturing lovers every day and we couldn’t be happier. 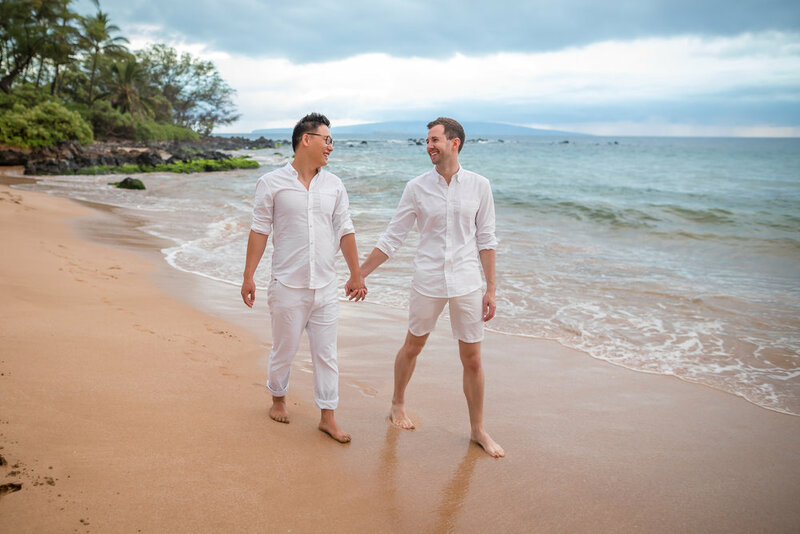 Whether you are celebrating your anniversary, honeymoon, or a romantic getaway for two, you won’t go wrong booking a session with Pacific Dream Photography. Between all the romantic places and fun activities, remember to leave some time to capture these breathtaking moments. Tell us your story and together we will create something beautiful. Don’t be afraid to show us your genuine, quirky, fun love that you share together. This will allow our team to capture the story behind your true love. As you can see, Daniel and Courtney’s love radiates through the camera lens. After seven years of marriage, this young couple is still as giddy as when they met. What better way to spend sunset than strolling along Shipwrecks Beach, while capturing the moment? Daniel and Courtney spent their days on Kauai exploring countless waterfalls, Waimea Canyon, and enjoying the natural paradise. Not to mention the scenic drives and glorious beaches. No wonder why Kauai screams romantic getaway! To end the night, the happy couple shared an intimate candlelight dinner at Tide Pools restaurant. What an amazing night in tropical paradise. From everyone at Pacific Dream Photography, Happy Anniversary! Daniel and Courtney, thank you for celebrating with us. Many of the people who visit the Islands of Hawaii are first timers. Many are celebrating something special, and some just finally made the time to take the long vacation out. When most first experience Hawaii, its almost like experiencing a different country with a culture, traditions, and even a language that is completely foreign. Steve and Elen were first timers to Hawaii, and they dove right in. Steve and Elen searched out the local cuisine, drove through the beauty of the aina, and even went to a luau to experience the culture of the Hawaiian Islands. Visiting us from Connecticut, and leaving their 6 boys behind, I can imagine that these two felt a renewed sense of youth and wonder exploring our island of Oahu. No doubt, a Hawaii beach photo session would allow them to continue to experience it for years to come. Elen and Steve were guests at the Kahala Hotel & Resort on the south shore of Oahu. Lucky for them, it is one of the most beautiful sites on the island for a couples photography session. We spent a short half hour session with them walking the white sand beaches, and capturing their radiating love. Its easy to fall in love with the island and not take the time to capture your Hawaii memories. In our experience, vacation passes way too quickly, so why not hire a vacation photographer to help you remember your visit and live it over and over in years to come. One thing I do know to be true, once you visit Hawaii for the first time, you will forever have an itch to come back. Group portraits are a fantastic way for friends and families to spend quality time together and capture unforgettable memories. Whether you're taking a much-needed family reunion trip to the islands or looking to update your photos of friends and loved ones, who wouldn’t want group photos on a lush beach in Hawaii to remember your time in paradise? Capturing photos of a large group can be a difficult task, but fear not! With some helpful tips; let our artists at Pacific Dream Photography make your group photo session a success by providing you with ever-lasting commemorations. A relaxed photo is important, but a little direction is always a great key to ensuring a successful photography session. Most of the time a group will pose themselves naturally with tall people in the back and short people in the front. But if needed, feel free to take control of your group and position others in visually ideal positions. Here at Pacific Dream Photography, we like to make sure our subjects feel comfortable without feeling too forced, so loosen up and don't forget to take in the beautiful scenery! When posing your group, place people according to families and couples. This makes it easier for everyone, as they are able to locate themselves easily when looking through their photos. If you'd like the session to be centered on two specific people, place them in the middle of the group. It is very important to make sure that everyone's faces are visible. If they cannot see the camera, they will most likely not be seen in the photo! As a professional photographer, it is our job to scan the group and make sure that everyone is clearly visible. If one or more subjects are looking away, it may take away from a potentially perfect photo. To avoid awkward spacing in group photos, use a wide angled lens and tighten up the frame. Closing in any unwanted gaps between individuals is a great way to unite your group. One effective technique is to tell your group to lean their heads in close together. Allow your subjects to hug and hold each other and be ready to capture big smiles at any moment. 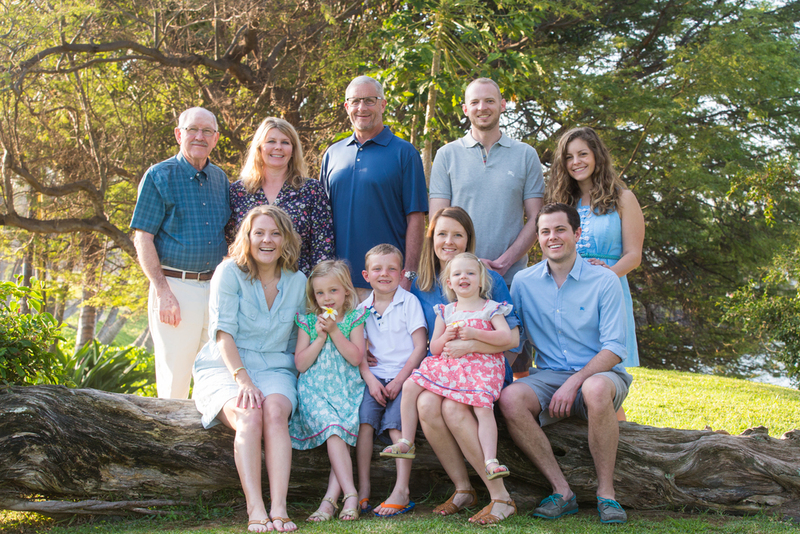 As professional photographers in Hawaii, we take pride in sweet moments with family and friends. Your group will thank you for a great time and stunning group portraits. One of the most important options to consider when booking your reservation with Pacific Dream Photography is whether to choose a sunrise or a sunset time. For some of us, who aren’t early risers, the sunset time is an easy choice; although, the sunrise light is exceptional! Here at the Grand Hyatt, Kauai, there are advantages and disadvantages to each time. The sunrise session is one of our personal favorites. The quality of light is gorgeous! You’ll notice a crisp quality of light, soft flattering skin tones, and a rose gold hue to the color, on some occasions. It is also important to consider the metaphors associated with a sunrise, for example: new beginnings. If you will be joining us celebrating something like an engagement or baby-moon, you might want to consider this time. It can also be a little more private with less people on the beach. Typically, the sunset session is the most desired time. The light is rich and golden with saturated colors and strong contrast, making for striking imagery. The sun sets in the west and lights up a golden Shipwrecks beach cliff, creating a beautiful color contrast between the blue sky and ocean. The one possible downside to a sunset session is that there might be more people on the beach, and in the background of your photos. So, choose wisely! You can’t go wrong with either choice; but we certainly want to capture you the way you’d like to be remembered. We absolutely love capturing the memories of family vacations and beautiful weddings. However, that is not all that we offer for services here at Pacific Dream Photography. Allow us to tell you more about our Corporate Photography. Very often, we are also part of company's incentive programs or meetings in a beautiful place away from the office. As photographers, it is a pleasure to see hard-working individuals let loose and having fun in a different environment. For a company, it's an opportunity to recognize your company’s employees and commend them on their hard work and the commitment they bring to the team. Whether it is an elegant awards ceremony or treating them to a fun-filled day of zip-lining, our team of photographers will be there to commemorate the well-deserved celebration of your successes. Allow us to capture the emotion of an award being received, your colleagues and their spouses enjoying the beauty of a Hawaiian sunset, or the laughter that comes with a co-worker being pulled on stage by a Hula performer.... "Who knew Bill from Customer Service could shake it like that?" You and your team will be utterly thankful for having photographic proof of it.